The first leg of the Tri is always the swim. A standard format for triathlons, athlete enter the water first for safety reasons. Entering the water when you are the most strong and have not needed to recoup from any other athletic exertion. Safety first = water first. The swim portion is 750 meters, which is 1/2 mile. Being an all-female Sprint Distance Tri - we are made of the most compassionate and caring gang of ladies you will ever meet! While still competitive, a majority of our athletes are truly racing the clock or against themselves. But, in the traditional Tri world, the bike portion comes next for safety; athletes are semi-fresh and not near the peak of their endurance. The bike portion is 20 km, which is about 12.4 miles. Or walk. The last leg of the triathlon is the run because it is where you get your moment of glory. Sprint to the finish line, ham for the cam, wave to our pit crew. And, should you need us, our pit crew can reach you easily. Finally, it is easier to put a medal around the neck of a runner than a biker! The run/walk portion is 5k, which is 3.1 miles. Please make sure to check your travel time before the event to ensure you arrive in enough time to register and start on time. Volunteers are the core of the Tri For The Cure. We could not do it without your support and assistance. Volunteers are needed on race day, Saturday, August 3rd and during Pre-Race Expo before the event. Our unwavering gratitude for your contribution to an amazing day! If you don't know how to swim, hire a swim coach and learn. Do not show up for the event if you haven't dipped a toe in the water! No floaties, no noodles, no kickboards, no lifevests, no flippers, no snorkeling masks or breathing devices. Simply remember-when you enter the water you'll be wearing your designated swim cap, goggles, your suit and nothing more. Do not attempt to participate in the triathlon without swimming in open water at least once for ½ mile (750 meters). Practice at any one of the area reservoirs such as Chatfield, Cherry Creek, Boulder, Aurora, etc. Contact the park nearest you for details on swim areas. 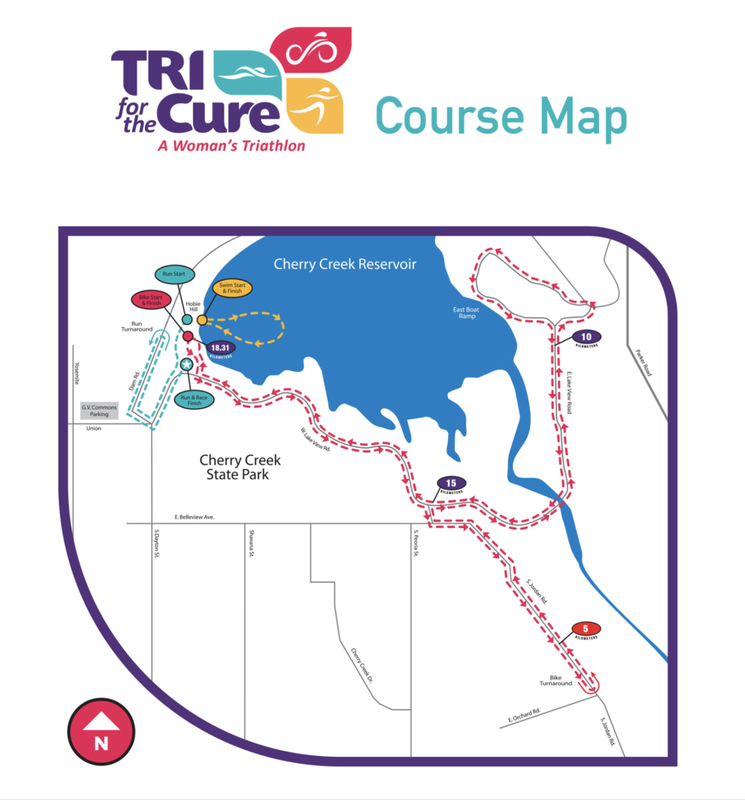 Tri for the Cure provides a group of swimming experts to help you along if necessary. They will have swim noodles that you may rest on, but you may not use the flotation device to propel yourself forward in the water. Swim Buddies will swim the distance with you, but will not physically assist you in any way. The Swim Buddy tent is located at the swim start….alert a Swim Buddy if you require assistance. The course is monitored by experts during the race. You will see kayaks and motorized vehicles along the course. There will be lifeguards to assist you if you need to rest. How was Tri for the Cure - Denver?